Todd Gaffke enjoys a diverse musical career as a performer and educator. He has appeared as a soloist and chamber musician throughout the U.S. and in Europe. His playing has garnered numerous awards including: Downbeat Magazine’s Outstanding Classical Soloist, Liberace Foundation Scholarship Competition winner, and 1st-prize in the Plowman Chamber Music Competition. He has performed in professional orchestras and concert bands throughout the Midwest. Dr. Gaffke performs frequently with the University of Akron Faculty Jazz Group. He has performed at the Detroit and Lansing Jazz Festivals, and performed with the Cleveland Jazz Orchestra, Harry James Orchestra, and Lansing Symphony Big Band. 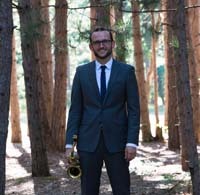 Dr. Gaffke is currently Assistant Professor of Saxophone at The University of Akron. He earned a BM from Central Michigan University, and MM and DMA degrees from Michigan State University. His primary teachers include Joseph Lulloff, John Nichol, and Rob Smith. Dr. Gaffke is a D’Addarrio Woodwinds Performing Artist. Deborah Yasutake Piano Deborah Yasutake is an active collaborative pianist in the Akron/Cleveland area. She is a staf . . .